This is an area of superlatives; England's highest mountains, it's steepest road and oldest water mill are all here. Hardknott Roman Fort, in the Upper Esk, must have been amongst the most dramatically positioned in the entire Roman Empire. Some of the stone circles on the fell above Boot are apparently, according to the National Park Archaeologists, some 5000 years old, which makes them the same age as Stonehenge! Many guests come to Boot and don't get further than the two excellent pubs, and who can blame them? 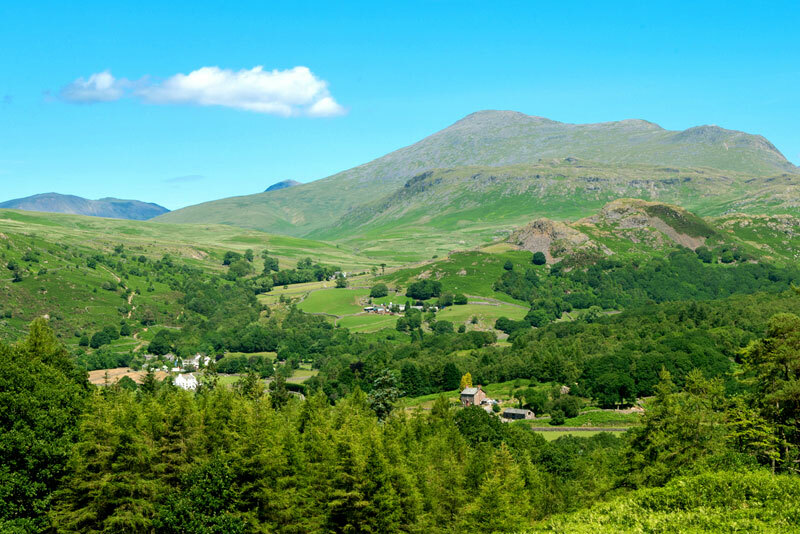 However, there are many easy and wonderful walks and places of beauty and history to discover and enjoy in the glorious Eskdale Valley. For those of you who maybe just had a fleeting stay or didn't get too far or did not know where to go, here are just a few of the delights of 'Glorious Eskdale'. Two rivers run down the valley. The Whillan Beck, which comes off the flanks of Scafell across a vast expanse of moorland around Burnmoor Tarn right beneath Scafell, cascades down through the waterfall near the packhorse bridge, running through our gardens with Whillan Beck Cottage overlooking the Beck - hence the cottage name (you can just see the head of the cottage peeking over the bridge in the above photo). Our picnic spot on the Beck is a real delight and it's a great spot for a morning coffee or evening glass of wine (see photo below). The main River Esk rises high on the fells between the mountains of Esk Pike and Great End. It flows as a stream to the enormous plateau like Great Moss with many of the highest peaks in the Lake District rising above it. From there it cascades down past the very pretty Lingcove Beck bridge where there are some excellent swimming pools beside a superb and easy walk through Upper Eskdale. From Upper Eskdale, the River Esk, criss crosses and snakes down the valley past Doctor Bridge, which is another easy and excellent walk from Boot. It goes past the stepping stones (see photo below), which are great fun and these are beside St Catherines Church just a 10 minute easy level stroll from our cottages. Right near here and just 10 to 15 minutes further on and you get to the base of Stanley Ghyll waterfall with another 5 to 10 minutes on to the top (take a look at the stunning reflections two photos down). Going on downstream, the River Esk runs beneath Trough House Bridge beside Stanley House and the woodlands here are a stunning place to see the spring bluebells or autumn mushrooms and toadstools. Eventually the Esk passes the stunning Muncaster Castle which is an excellent day out arriving at the sea in Ravenglass. Here it joins the River Mite and River Irt in a three river estuary. This was used by the Romans as a port to keep the fort on Hardknott and settlement at Ambleside stocked with wine and other luxuries from Italy! As well as the beautiful valley and rivers, there are 5 pubs in Eskdale - two right here in Boot and the other 3 a short hike or 5 minute drive away. The Roman Fort a third of the way up Hardknott Pass has to be seen to believed and I always stop there to take a look. It is so interesting and atmospheric with incredible views, especially 20 metres outside the north gate. Hardknott Pass and the next one, Wrynose Pass, are a thrilling drive for guests who like a motoring challenge. Fit or foolhardy cyclists can sometimes be seen sweating and puffing up or down the 1 in 3 hills. Alternatively, there is of course the much easier Eskdale Cycleway which follows the River Esk on the valley floor. Above Boot there are the historic Peat Huts from the time when peat was cut on the fells and one of these belongs to Bridge End Farm. I keep intending to go up onto the fell to cut some peat to dry in our peat hut then burn on the Farmhouse hearth. There are 5 stone circles a little further on from the peat huts, two are fiendishly difficult to find but the other 3 are an easy 15 to 20 minute walk from our cottages. One is Bronze Age (around 3000 years old) and two are Neolithic (5000 years old). Back down in Boot you can visit England's oldest working twin wheel water mill just across the 17th century packhorse bridge. They are our neighbours and along with Bridge End Farm these two are the two oldest and most historic properties in Boot. The entire Mill site and entire Bridge End site are Grade 2 Listed of historic importance. Do come and explore and discover more of 'Glorious Eskdale' sometime soon. Having mentioned their name sakes above, we have some special offers on Whillan Beck Cottage, Hardknott Cottage and Wrynose Cottage over the next few weeks so take a look on our website and see our special offers.